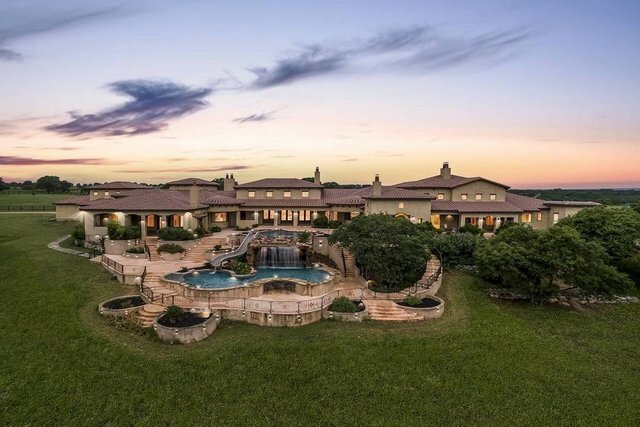 This luxury ranch estate is located just 5.5 miles from IH-10 in sought after Boerne. Situated on approximately 64 acres, the masterfully designed estate spares no detail.The exquisite interior finishes include intricately laid travertine stone flooring, custom stone and brick ceiling treatments, exposed wood beams, stone wall accents and wrought iron fixtures.The master wing is located on the opposite side of the house from the guest suites for maximum privacy. The master wing includes a two story office with gorgeous custom wood shelving and spiral staircase to the library. The master bedroom and bath exterior doors open to a private, tranquil morning porch. The expansive master bath offers a large soaking tub and walk in shower, separate vanities and two custom designed closets. Grand living spaces and a centrally located game room with a bar, loft and media screen offer hours of entertainment.Additional interior amenities include a workout room with dry heat sauna and additional large living room adjoining the secondary bedrooms and a second master suite with an en suite bath. Ideal for entertaining, the formal dining room offers access to a carefully designed wine room with storage for a collection of hundreds of bottles.The top-of-the-line chef`s kitchen is clad with premium finishes and fixtures including custom cabinetry, large center island and professional-grade appliances.A fully-equipped outdoor kitchen, sun deck, two-tiered pool with a water slide and swim-up grotto bar, putting green, a greenhouse, hiking and riding trails are and a stock pond are just a few of the ways to enjoy the outdoors.The property also offers a three bedroom, two bath guest house, a four-stall barn and 18 total garage spaces. The property is fully fenced with a high game fence and is Ag Exempt. Heavy equipment, exotic wildlife and much more convey with the purchase.